The Pinewood Leisure Centre, as it’s now known, is in Wokingham Without rather than in Crowthorne. 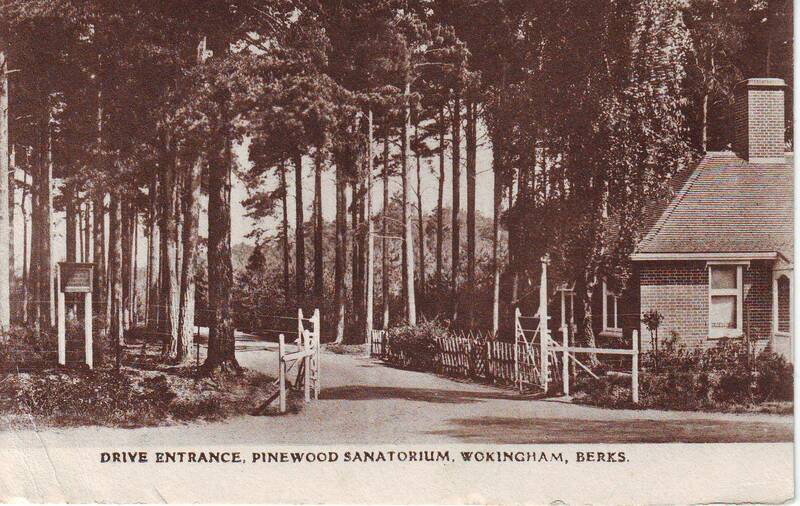 I believe Pinewood Sanatorium was set up as a TB hospital for patients from London. In World War II it was a US Air Force hospital. In the 1970s the site began being used to house various locals sports clubs and groups. It now houses gym, judo, boxing, shooting, tug-of-war and model railways clubs (amongst others). It also has a mini railway and allotments. Wellington College Woods, Crowthorne:Frith 57171.Franked Camberley, Surrey, 12.45pm, 9 June 1941. “Crowthorne”. Franked Sandhurst, Berks, Sp 18 11. "The Pine Woods, Crowthorne, Berks"
“The Pine Woods, Crowthorne, Berks”. F Satchell. “Crowthorne Woods”. Frith no. 84422. “Wellington College, Pathway near Little Wicket Gate”. Frith no. 57172. “Crowthorne, In The Pines”. Frith no. 57924.